Know your legislators: USA.Gov will help you locate your federal legislators. Look up your state legislators. All members have valuable information on their web pages, including biographical information, voting history, how they voted on previous legislation, and committee assignments. Build a relationship: Use your elected officials’ websites and social media presence to see where they may be speaking while back in your state or district. Look for opportunities to interact in person with your elected officials beyond visiting their offices. Follow up: Follow through makes all the difference! Look for opportunities for further interaction. Include your colleagues: Remember that there is power in numbers! Ask your colleagues and fellow state association members to join you as an advocate. Building a coalition is one of the best ways to influence policy. Get support: As a member of NCRA, our Government Relations Department is ready to support you as you prepare for engagements with stakeholders by answering questions and offering feedback and resources. Let us know how we can help, and come to the NCRA Leadership & Legislative Boot Camp to build your advocacy skills. Aaron Frey, attorney general for the state of Maine and former NCRA lobbyist, was profiled in an article posted March 3 by the Press Herald. 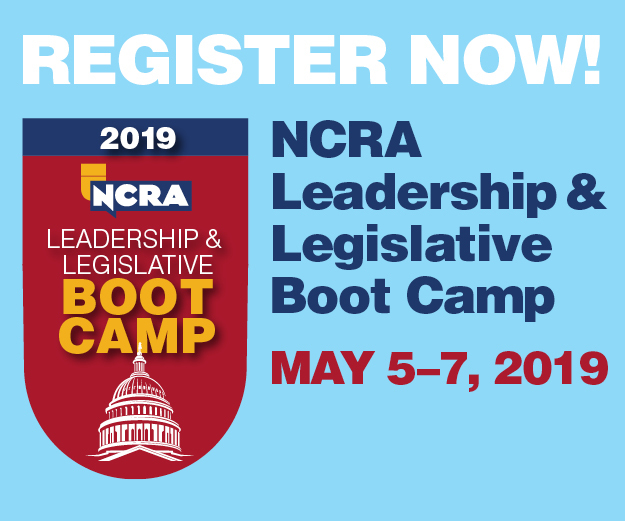 Registration for the 2019 NCRA Leadership & Legislative Boot Camp is now open! 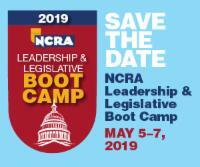 NCRA Leadership & Legislative Boot Camp, NCRA’s premier advocacy education event and legislative fly-in, is scheduled for May 5-7 and promises to be one of the best events yet! In the heart of Alexandria Old Town, Va., state leaders and members will learn how to be effective advocates for the court reporting profession and experience what it is like to advocate on Capitol Hill. NCRA’s Interim CEO and Executive Director Dave Wenhold, CAE, will return and join Director of State Government Relations Matthew Barusch and members of the NCRA Board of Directors to impart valuable skills and knowledge, such as speaking to elected officials, testifying before Congress, and using grassroots to advance your association’s goals. “Participation in NCRA’s Boot Camp is one of the very best investments a state can make for their association because it trains another generation of leaders. Those who have gone through Boot Camp say it changes their lives and makes them more confident in all aspects of their career,” said Wenhold. Registration for the event is $225 for NCRA members and $325 for nonmembers. NCRA will offer discounted room rates at the Embassy Suites in Alexandria Old Town, but only for a limited time, so book your registration today! Why I attended NCRA’s Boot Camp — and you should too! The first time I went to Boot Camp, I was excited and terrified. I had heard so many things about it – and I was thrilled to finally have the opportunity to learn how to advocate for the profession. When I arrived at Boot Camp, it was everything I could have ever expected and more. I was taken out of my friend zone and my comfort zone, and I was put with a table full of strangers who were also my peers. We all worked harder in those few days’ time than I ever had. I was stressed and exhausted and exhilarated. One might wonder where can you get all these emotions and feelings? Go to Boot Camp, and you’ll understand. Boot Camp ends with a trip to visit our state representatives on Capitol Hill in Washington, D.C. Dave Wenhold, CAE, PLC, NCRA’s Interim Executive Director, and the other NCRA staff members who presented several of the sessions for the training portion that year, had thoroughly prepared us for what might come our way, how to present our agenda, and what to do when we were rushed or forgot what to say. When we got to the Hill, I was terrified. But we had our assignment, and we were as prepped as we could be. We talked to our representatives or their staff members, and we gave our spiel and were well received. I was completely stoked about what I had learned, and I was ready to bring what I learned back to my home state and my association and see what it could do for us. I went back for a second round of Boot Camp because I felt like, “Well, if I got a lot the first time, what might I get the second time?” I was impressed with how much I remembered, but I was able to really work on my weaknesses and help others in the group feel more confident and excited about the task in front of us. I took my good friend Dani Murray, RMR, CRR, with me this time, and we killed it. We both worked hard in our groups. I was able to be more of a mentor to the newbies in my own group, and it felt good. It really is true when they say that to really reinforce what you’ve learned, you should teach it and share it with others. If I could tell reporters and leaders one thing, it would be go to Boot Camp! It’s the one leadership opportunity that can change your life — not only in the court reporting profession, but in all aspects of life. You become a better leader, and your confidence soars. Just as an example, after this training, the state employees, including me, were trying to get a raise as we hadn’t had one in 10 or 15 years. We went to our capitol and we tracked down our local representatives to encourage them to vote for the raise. One of the people we had to talk to was a rather tough cookie. I saw her and asked to talk to her, but she kept walking, so I locked in step with her and I talked to her all the way to the door where I couldn’t go past. I turned around and all the leaders of this group had their mouths wide open, couldn’t believe that I took her on. If you are ready to really make a difference in your profession, don’t miss this chance to learn how to be a great advocate for yourself and for your profession. Cindy Isaacsen, RPR, is an official from Olathe, Kan., and a member of the NCRA Board of Directors. She can be reached at Cindy.Isaacsen@jocogov.org. The Department of Justice is open – and there’s even a court reporter! Wisconsin radio station WTMJ 620 AM posted a video clip on Feb. 12 from the Jeff Wagner Show of local court reporters showcasing their skills during Court Reporting & Captioning Week. The 2019 event is May 5-7. It will include two full days of training, exploration, and hands-on activities designed to give everyone who attends the takeaways necessary to become successful advocates and leaders in the profession at the local, state, and national level. Training will end with role-playing and mock interviews to help prepare attendees for the final day of the event that culminates on the third day with visits with Washington, D.C., lawmakers on Capitol Hill. The site of the 2019 event is the Embassy Suites by Hilton in historic Old Town Alexandria, Va., just outside of Washington, D.C. 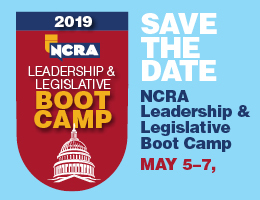 Anyone in the court reporting, captioning, or legal videography professions wanting to grow and hone their advocacy and leadership skills should make plans to attend the 2019 NCRA Leadership & Legislative Boot Camp. Watch the JCR Weekly and JCR magazine for more details and information about registration for this one-of-a-kind event. The 2019 NCRA Leadership and Legislative Boot Camp promises to provide attendees with an experience like no other when it comes to learning firsthand the power of advocacy and the influence good leadership can achieve. The 2019 event is being held May 5-7 and will include two full days of training, exploration, and hands-on activities designed to give everyone who attends the takeaways necessary to become successful advocates and leaders in the profession at the local, state, and national level. Training will end with role-playing and mock interviews to help prepare attendees for the final day of the event, which culminates with visits with Washington, D.C., lawmakers on Capitol Hill. The site of the 2019 event is the Embassy Suites by Hilton, in historic Alexandria Old Town, Va., just outside of Washington, D.C. Anyone in the court reporting, captioning, or legal videography professions wanting to grow and hone their advocacy and leadership skills should make plans to attend the 2019 NCRA Leadership and Legislative Boot Camp. 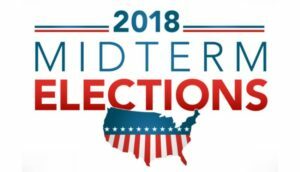 On Nov. 6, the American people cast their ballots for a variety of federal, state, and local elections, with turnout surpassing that of the last two midterms in 2010 and 2014. As of this printing, the Democrats have taken control of the U.S. House of Representatives for the first time in eight years, holding at least 234 seats, and Republicans currently holding 201 seats; three races are still uncalled. The Republicans held their majority in the U.S. Senate, having flipped three red state seats held by Democrats. A few House and Senate seats have yet to be called, but these facts are beyond dispute: The Republicans maintain a slim majority in the Senate, while the Democrats won control of the House. The Democrats picked up 37 seats in the House of Representatives, largely in suburban districts. This means that Democrats will have an almost 30-seat majority in the House in the 116th Congress beginning Jan. 3, 2019. Some of the flipped seats come in swing districts that have slowly started leaning Democratic over the last few years. This trend was exemplified by the election of Democrat Lucy McBath in Georgia’s 6th district. Current Rep. Karen Handel was elected in a special election against Jon Ossoff in 2017 by a margin of approximately 3.5 percent. McBath beat Handel just 16 months later by just over 3,000 votes, or about 1 percent. Another trend this year was the unprecedented number of women elected to represent Congressional districts. More than 100 women will now be serving in the House, the most ever in the history of the United States. Many of these newcomers unseated longtime members, such as in Virginia’s 7th district where Democrat Abigail Spanberger won over incumbent Republican Dave Brat. A third trend to watch showed that increasingly progressive candidates, exemplified in New York’s 14th district where Alexandria Ocasio-Cortez won against the more moderate Rep. Joe Crowley this June in the Democratic primary, were capturing votes. The Senate will remain in Republican control for the next two years. As of this printing, Republicans have picked up at least one seat overall, increasing their majority to 52 seats. In a few red states, Republicans won over sitting Democrats: Missouri’s attorney general Josh Hawley (R-Mo.) beat Sen. Claire McCaskill (D-Mo. ); Rep. Kevin Cramer (R-N.D.) won over Sen. Heidi Heitkamp (D-N.D.); and businessman Mike Braun took over the seat occupied by Sen. Joe Donnelly (D-Ind.). In one of the most expensive races of the cycle, Gov. Rick Scott (R-Fla.) beat Sen. Bill Nelson (D- Fla.) by roughly 10,000 votes out of more than 8 million cast. There were a few surprises: In Arizona, Rep. Kyrsten Sinema (D) defeated Rep. Martha McSally (R) to become the state’s first female Senator and the first Democrat elected to the Senate from Arizona in 30 years. Also, in Nevada, Rep. Jackie Rosen (D) beat out incumbent Senator Dean Heller (R). The last remaining Senate race was decided was in Mississippi, where appointed Sen. Hyde-Smith was forced into a run-off with former State Agriculture Secretary Mike Espy. When the final votes were in on November 27, incumbent Republican Cindy Hyde-Smith won reelection over Democrat Mike Espy by 8 percent. At the state level, Democrats also made some gains overall, flipping seven governorships and picking up hundreds of seats in state legislatures nationwide. Two of the most hotly contested races were called almost two weeks after November 6, with Republicans prevailing in both the Georgia and Florida gubernatorial races after provisional ballots were counted. What does this mean for governing during the next two years? Following changes in the Trump administration and statements from members of both the House and Senate, we can expect intensified focus on the ongoing Special Counsel investigation. While we will undoubtedly see legislative focus in the House on liberal agenda items such as gun control and healthcare, legislation on these issues will likely be stalled in the Senate. Likewise, it will be difficult for Senate Republicans to pass legislation through a Democratic House that is too left-leaning. A few small bipartisan legislative items under discussion, such as some type of infrastructure package or legislation on digital privacy, could move forward. In the Senate, expect to see increased activity on judicial confirmations. One of the major objectives of the Republicans in recent years has been to appoint conservative judges to the courts. Now that Republicans have a larger majority in the Senate, we can expect that the Senate will continue to work on confirming President Trump’s judicial nominees at an increased pace. How can we expect these results to impact the court reporting and captioning professions? NCRA’s Government Relations Department is optimistic about what the results mean for NCRA and its legislative agenda. First, it is important to note that the vast majority of NCRA’s congressional allies have won re-election, including members of Congress such as Rep. Bradley Byrne (R-Ala.), Rep. Brett Guthrie (R-Ky.), Rep. Ron Kind (D-Wis.), and Rep. Jimmy Panetta (D-Calif.). Second, the House of Representatives is likely to address some legislation that NCRA supports, such as the Training for Realtime Writers Grant, a program included in the Higher Education Act (HEA) that funds schools teaching realtime. The HEA is long overdue for reauthorization, and we are optimistic that the House will bring this measure up for consideration. Third, another component of the 2019 Legislative Plan recently approved by the NCRA Board of Directors includes introducing legislation that would require court reporters to be used to create a record in federal capital case trials. The pursuit of these requirements, the first of its kind, is likely to be received favorably by the House of Representatives in 2019. It is very important for all of us to engage in our government and political spheres, not just as court reporters, but as Americans. I’d like to thank each and every person who voted in the 2018 midterm elections, and I hope that you will continue to remain involved and engaged in protecting the professions. One way that you can do that is to attend Boot Camp on May 5-7, 2019, which will teach you about the nature of politics and how to advocate for the court reporting and captioning professions. You can also contribute to the NCRA Political Action Committee (PAC), which utilizes your contributions to help elect and re-elect members of Congress who support the professions of court reporting, captioning, and legal video. 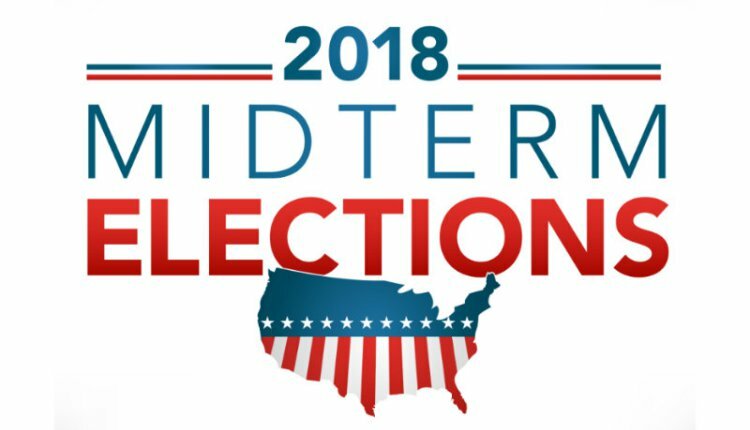 If you have any questions about the midterm election results, Boot Camp, or the PAC, please contact me at mbarusch@ncra.org. 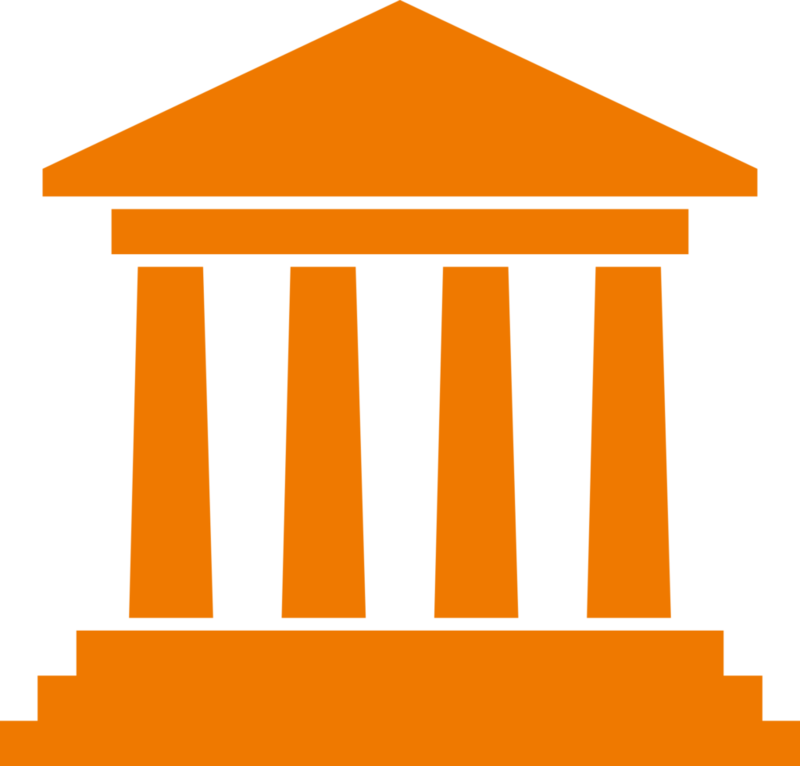 Remember, the best tool that the court reporting and captioning professions have in their advocacy arsenal is you!